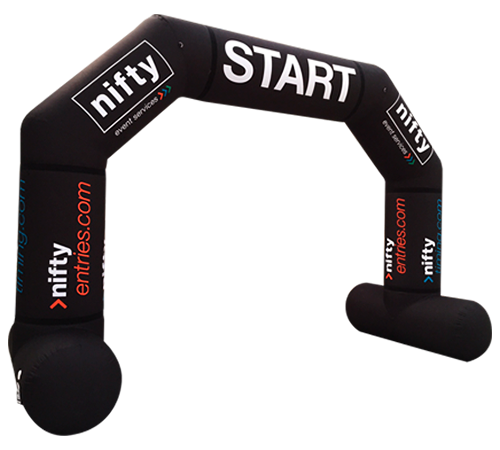 Inflatable Arches are a versatile advertising solution suitable for marking the start finish line of race events, or simply as an advertising tool promoting a product or brand! Available in a variety of shapes and sizes from 4m to 12m wide, our bold eye-catching designs stand out from the crowd giving you maximum exposure. Full printing on all sides is included. Additional banner options are available. Inflatable Arches are a versatile advertising solution, suitable for marking the start finish line of athletics or racing events, or they can simply be used outside a business to promote a product or brand! Available in a variety of shapes and sizes from 4m to 12m wide. Our stunning Spider Domes are the bestselling inflatable structures in our range. Civil service events, university open days, motorsport pit lane shelters and subscription sign ups are just a few of the ways our Spider Domes are put to use every day. There are four Spider Dome options with key unique benefits. Our stunning Spider Domes are the bestselling inflatable structures in our range. Product launches, open days, motorsport pit lane shelter and subscription sign ups are just a few of the ways our Spider Domes are put to good use. When it comes to standing out from competitors whilst providing a practical, safe environment for your staff and customers, our Inflatable Cube Marquee is ideal. Internal and external full colour print is available and transparent walls, detachable doors and an all-weather PVC tarpaulin roof are just a few of the options available. Heavy duty D rings and zip pockets around the base of the walls offer weighting options for indoors and outside. Due to the extent of customisation available, there are no Buy Now options available. Please complete the Free Visual form with any ideas and we will reply with a design and price options within 24 hours! When it comes to standing out from competitors whilst providing a comfortable environment for your staff and customers, our Inflatable Cube Marquee is ideal. 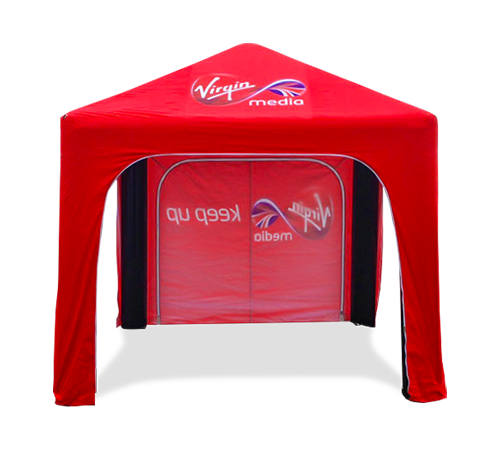 Internal and external full colour print is available along with transparent walls, detachable doors and an all-weather PVC tarpaulin roof. Our unique Inflatable Gazebo has been constantly developed over the last 6 years. The straight leg design offers a huge amount of internal space and an even larger external area to promote your brand. Sealed and constant air options are both made from a durable PVC tarpaulin, available in a number of colours. 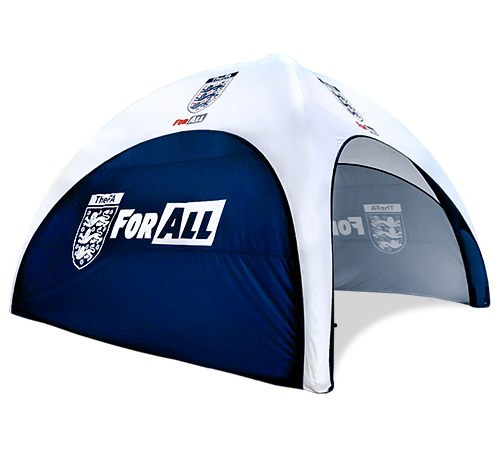 The external detachable canopy and walls are made from a high quality 600D Nylon with dye sublimation print and waterproof lining. The straight leg design offers a huge amount of internal space and an even larger external area to promote your brand. There is a sealed and constant air range made from durable PVC tarpaulin, available in a number of colours. 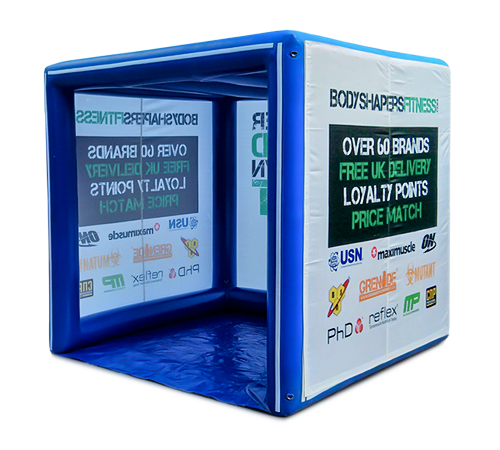 The Inflatable Impact Cube is a cost effective attention grabber, incorporating a rigid structure with interchangeable walls. Featuring a built in tarpaulin floor, PVC tarpaulin framework and an over-inflation safety valve, this high spec inflatable can be up and running in less than 5 minutes. 420D and 600D wall options, sealed air only. The Impact Cube is a cost effective attention grabber, incorporating a rigid structure with interchangeable walls. 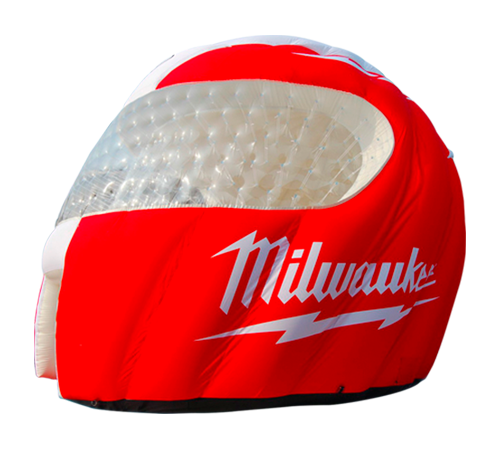 Featuring a built in tarpaulin floor, PVC tarpaulin framework and an over-inflation safety valve. 420D and 600D wall options, sealed air only. At Instant Promotion we design and build Custom Inflatables for any requirement. Whether it be a crisps can for snack promotions, floating cubes for triathlons or a giant motorbike helmet offering shelter at UK Super Bike races, every inflatable starts with an innovative idea. We will plan, design, refine, cost and manufacture in line with your guidance and approval. Trade shows are expensive to attend and getting the best return on investment from your space is critical. Our design and marketing teams are on hand to help you create a unique eye-catching inflatable that will draw more customers than ever before. We start by creating ideas based on your goals, target audience, budget and overall marketing strategy. We can enhance your inflatable space using interactive technology, branded furniture, counters, illuminated flooring and more. 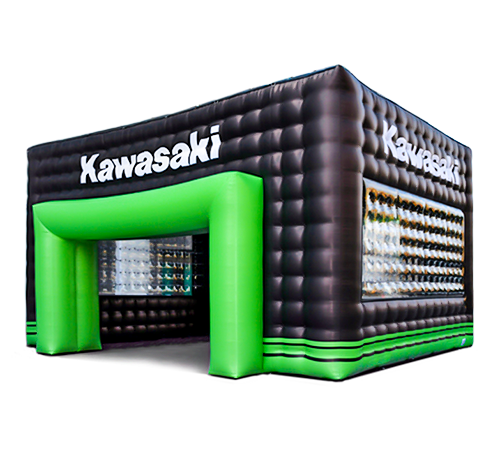 Whether it be a crisps can for snack promotions, floating cubes for triathlons or a giant motorbike helmet offering shelter at UK Super Bike races, every inflatable starts with an innovative idea. We will plan, design, refine, cost and manufacture in line with your guidance and approval.